This was only the second gourmet root beer I ever had but was by far the most influential. I first found it when I was 12 or so at the local Safeway and quickly became the go-to when I needed a treat. A celebration, get a Henry’s. Need to drown my sorrows, get a Henry’s. Want an extra good root beer, get a Henry’s. It helped that Safeways were pretty much in every town and they’d sell Henry’s chilled as well as in six-packs. Gas stations started getting them too so it was a a nearly ubiquitous awesome brew. There were other gourmet root beers about, but none were as good. After my brother’s car accident I had at least one of these per day. After a month or two, I couldn’t drink anything that didn’t come from glass, and I soon began the quest to find the world’s best root beer. So how did my beloved Henry’s stack up? Nice full, sweet Body with the perfect Head. It is one of the nicest Heads of any root beer. So much so that it is my standard Head to compare against other root beers. It’s rich and creamy with lovely vanilla and honey flavor complementing the sassafras. Wonderful Aftertaste, honey and vanilla lasting the perfect amount of time. There’s not a lot of Bite, but enough spice for me. It is very smooth and that’s how I prefer it most of the time. This is pretty much my gourmet root beer standard. I’ve had many a brew from all over the world, but not many can even stand level to, let alone surpass this. There are plenty that are better in one category or another, but Henry Weinhard’s is so good on all of it that it makes it a tough brew to beat. 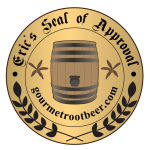 I make sure to drink a Seal of Approval root beer after each review to “reset” the palate. Most of the time it’s Henry’s. It is safe to say that this is the most important root beer in my life. See how it rates against other root beers. Another one from anthony as part of our on going root beer trades. The picture on the label is hilarious/ridiculous. The root beer keg, while firing off his six shooters, is actively trying to drink the drops of root beer coming out of the tap. But since the tap is where his nose would be, it’s akin to being excited to drink out of one’s own runny nose. But then the fact that he’s a root beer keg means, that what he drinks will go back into the keg, so maybe he just doesn’t want to waste any root beer. And then he’s shooting as well and … maybe I’m just over thinking it. Fun back story. About three weeks before I tried this I had bought some blue agave nectar from Trader Joe’s to see how it went with waffles. I liked it a lot and mused that it would taste really good in root beer while lamenting that the other non-blue agave flavored root beers I’ve had have not been stellar. The Body is full and rich with creamy vanilla and blue agave nectar featuring prominently. It has a rather heavy feel to it which I think is from said nectar. Everything mingles together to give a wonderful flavor that’s familiar and comforting as well as unique. The Bite is very mild. There’s a little spice but the carbonation is really lacking. The Head is poor, there’s no point mincing words over that. It’s very short, yet frothy so as to be better than the two-second-Head. It’s just that it isn’t carbonated enough to build a Head. The Aftertaste is a delicious combination of the blue agave and vanilla that lasts the perfect amount of time. Wow, yummy. I was right about blue agave in root beer. The only flaw in this is that it really doesn’t have much carbonation, which was their stated goal on the bottle. They wanted to make it so that it would go better in floats so no over foaming. I can respect that, but without a better Head, it can’t get the Seal, what a shame. Give this sucker a Henry’s style Head and some more Bite and we’re talking top 10 root beers ever, maybe even top 5. Oh well, it would make some amazing floats at least. See how it rates against other root beers.